We were so busy in 2011 that it seems like a blur that flew by. At a time when the mainstream media keeps pushing the notion that the Tea Party is losing its influence, I think that it is important to look back on all that you and I accomplished in 2011. 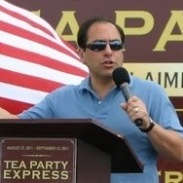 We can be very proud of all that we have done and use it as motivation to fight for Tea Party values in 2012. Each time Obummer wins political contests, America loses. This week, Obummer won the idea of extending the current lowered FICA tax rate, always called the payroll tax in the press. So what is the problem? It’s robbing Social Security of its dedicated source for funding. I’ve never once heard the press inform us about this however. But then again, the press is an agenda driven political arm of the establishment, not a source of objective fact based information. My dad was an engineer, and could get into the complex details with the best of them. But he always wanted a one page summary of every large study or difficult problem so that he could grasp the big picture. The Federal budget is such a study, but it too can be explained so the problem is easily understood.